It's always a delight to photograph in a new landscape with a uniquely wild color palette and textures, air and light. This is an experimental bridal session, shot at Papago Park in Phoenix, Arizona, on 35mm film and processed by PhotoVision film lab. Hair and makeup design were created by Arizona transplant Lindsay Wallen, including the blush pink color on both models and the flower crown incorporating a custom jeweled headpiece. This headpiece and bespoke white lace dress featured are sourced from local Scottsdale Ali's Fashion Design and hand-crafted by talented in-house designer Lana Gerimovich. The silver metallic slip, photographed as an alternative bridesmaid's dress, is featured in the current cocktail dress lineup at anthropologie. Our fellow Chicago/Arizona wedding double-timers at Hoot & Holler created the stunner of a bride's bouquet using orange poppies, ranunculus, thistle, parrot tulips, eucalyptus and spray roses. 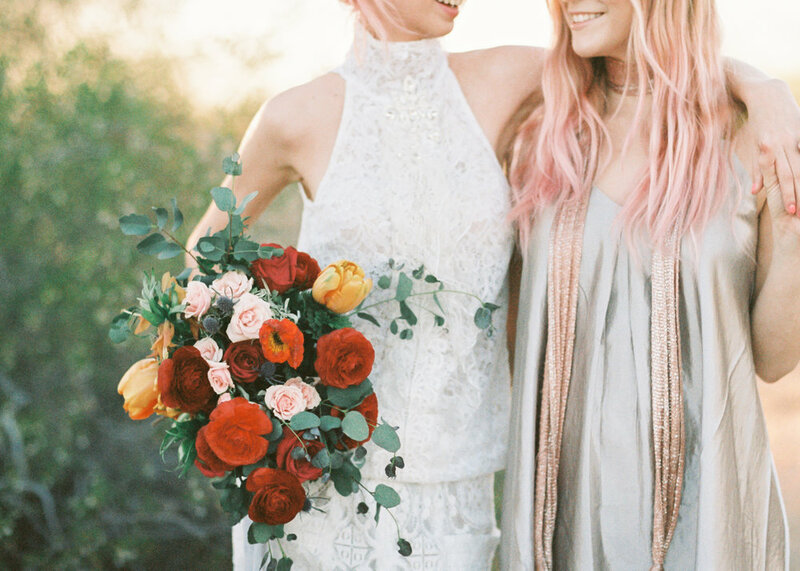 These gals are not just wedding florists, but live up to their motto of "floral renegades." Shoutout to my folks, Craig & Wendy, for being the best assistants, and Lindsay & Katelyn for being so willing to try, test and play with new ideas and experimental posing concepts as bride for a day models.